Has anyone else started feeling a little uneasy by the speed at which we seem to be hurtling towards Christmas!? I had an amazing time shopping my way through Bath last Friday with one of my oldest and best friends and the distinct scent of Christmas in the air would have been enough to send even the biggest of scrooges into a festive mood - it certainly spurred me into making a start on my Christmas shopping. The overhead street decorations sparkled as buskers sang their hearts out and final preparations were underway for the famous Christmas market - even down to spraying faux snow onto to the rooftops of the little market huts! This idyllic festive atmosphere made me even more excited about sharing the second of my Brit Decor:ate Christmas series. Whereas in the first feature we looked at simplistic styling, today we're going bold and beautiful with colour burst picks from the high street. I was particularly inspired by the neon glow look currently electrifying The Conran Shop with their array of uplifting designs like the 3 tier dip dye red & white paper decoration (8) and the intricate colouring of the multi-colour blue ball decoration (9). 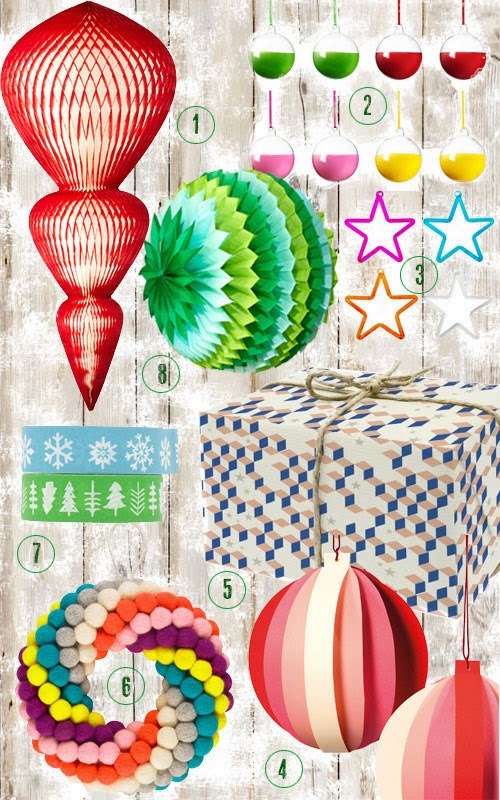 As we have come to expect, IKEA delivers the goods in their typically bright and affordable style with these perfect candy coloured Snomys baubles (2) - perfect for adding some concentrated dashes of colour to a fir tree or garland, as are the glass star decorations (3) from Idyll Home. And with the current trend for pom-poms, I could not resist the colour swirl effect of the wreath below from Paperchase (6). 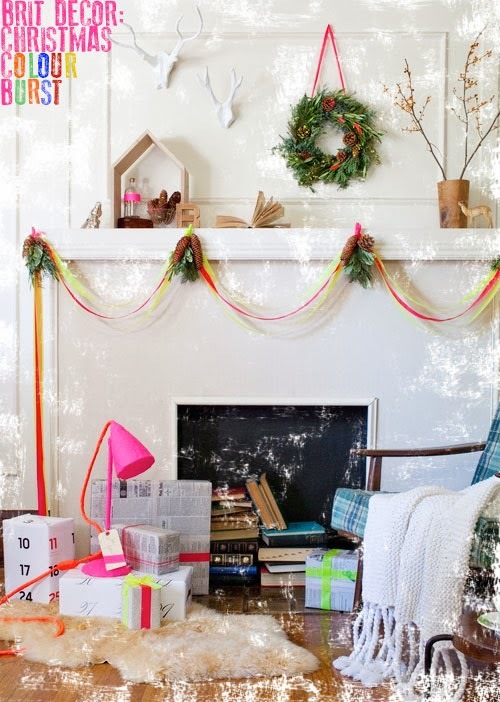 Have you figured out your style for this Christmas? Watch this space for the third and final in this series next week!